You’ll fall in love with this Charming Historic Downtown 1920s Bungalow with attached rental/in-law apartment zoned for income producing. 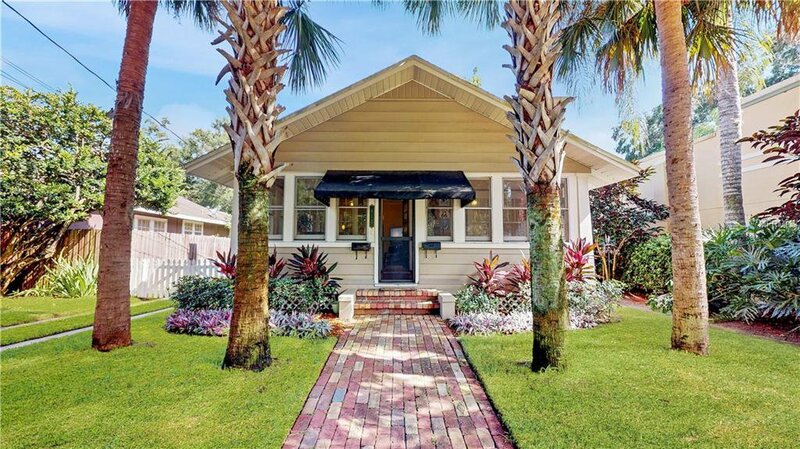 Situated in the Lake Davis/Delaney district, this very popular established neighborhood is on a classic brick street with old oak trees, among 3 parks, lakes, a short distance to Lake Eola & all the Downtown Orlando pleasures. Within this 3 bedroom, 2 baths, you’ll enjoy the ambiance of the bungalow styling with modern touches throughout. As soon as you drive up you’ll be impressed with the brick walkway & lush colorful mature landscaping offering picture-perfect curbside appeal. The front enclosed porch with numerous windows bringing in the natural light is the perfect spot for your morning coffee. Upon entering the main house you’ll feel the warmth of the original wood floors, wood burning fireplace, the coziness of the dining area with window seat, & the spacious updated kitchen. An abundance of beautiful cabinets, granite counters, breakfast bar with pendant lighting & stainless appliances just 3 yrs. old. 2 bedrooms & updated bath with pedestal sink & tiled shower with tub complete the main living area. The attached 1 BR apart. with separate meters, has adjoining laundry room, kitchen w/ appliances, laminate flooring, sunken living area with additional cabinets/counters, private entrance, bath, & a huge master BR with built-ins. Out back is a brick patio with firepit, large fenced yard & garage. Well maintained move-in ready, great schools & location. WELCOME HOME! Listing courtesy of MARKET CONNECT REALTY LLC. Selling Office: ALFANO PROPERTY MANAGEMENT.